A birding friend called Saturday morning to let me know that there were White-winged Crossbills at the Smithfield Cemetery. As WW Crossbills are usually only found HIGH in the mountains around here, dh and I decided we'd better run out to Smithfield to see if we could find them. 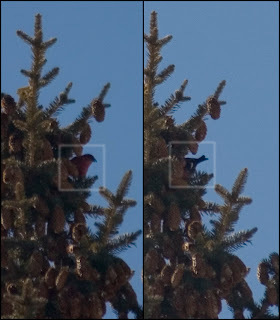 After chasing a small flock of birds from conifer to conifer around the cemetary, the male above kindly perched at the very top of a very tall tree long enough for us to get a good look at him. I wish you could see him better in the picture, as he is SUCH a pretty shade of red, and they have such interesting bills. 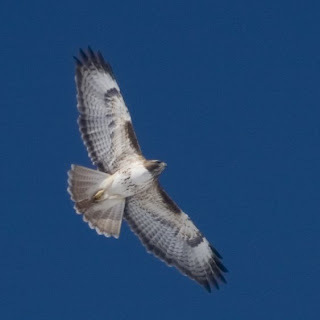 This is one of three Red-tailed Hawks that were soaring over the cemetery. We also saw Pine Siskins, American Robins and 3 Mule Deer at the cemetery. It was a beautiful day to be outside, and after the cold I've been laid up with all week, it was WONDERFUL to get out again! And great picture of the hawk too!